Please select Finance as your preferred payment method where you will be redirectly to payment provider “Pay4Later” to complete your finance application. You will then require filling in your details accordingly and they will assess your credit application. Pay4Later will conduct the necessary credit checks and references in order to confirm your eligibility for the credit application. We ask thousandst you have a good credit history with no history of late repayments or payment issues. Buy the jewellery you want with just a 50% deposit and just 6 monthly interest free payments on minimum £500 orders. Choose 12, 24 or 36 months repayment periods, available at variable interest rate. 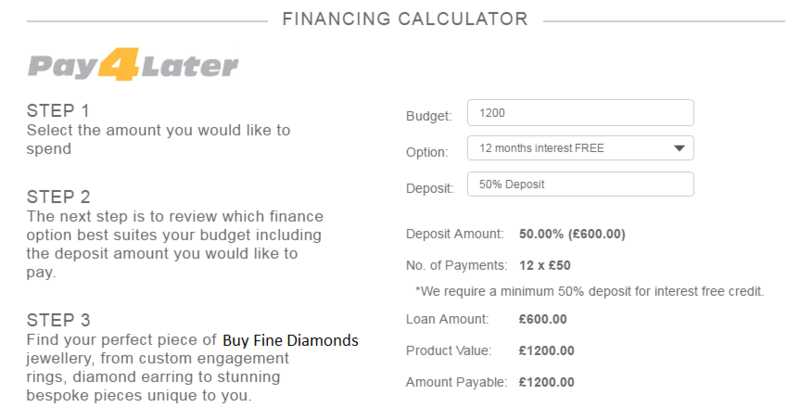 Invest in more expensive jewellery now but with low monthly payments. One stop shopping, no need to go to the bank to secure a loan. Fixed payments allowing you to budget effectively. 3How Much Can I Borrow? Yes, 50% deposit is required on all orders. 5How Are My Monthly Payments Made? 6What Type Of Jewellery Can I Buy On Finance? 7Can I Pay Off My Loan Early? You can settle your loan agreement at any time. Simply get in touch with Pay4later and they will calculate the outstanding balance and send you your settlement figure. Your settlement figure and date are calculated in line with the Consumer Credit Act. 8If you refuse my application, what is the reason? Please bear in mind that it is not Buyfinediamonds who have declined your application, it is pay4leter who are providing you the finance, and we cannot give you any information regarding why your application was refused.